Our first run-in with a Volkswagen Rabbit diesel, sometime in the late 1970s, began and ended with the phrase, "Mister, I think your car's on fire." In the ensuing decades, the company's oil burners, now designated TDI, grew more prevalent, despite a few hiccups regarding quick-burnout glow plugs, tightened emissions controls and varying sulfur content. 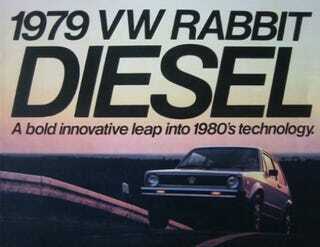 Now, the company's looking for the oldest running VW diesel in the US, which as Edmunds Inside Line points out, will likely be a 1977 Rabbit (12,393 were sold that year). The winning owner will get the use of a 2007 VW Touareg V10 TDI for six months. Not that they'll need it. Anyone who could keep a Rabbit Diesel running for 30 years could probably build his own car out of coffee cups and discarded lawn furniture, presumably at will.